Trump Russia Evidence Becoming Clear, Trump’s In Trouble….Between following the money, sexual escapades & the Russians, under the weight of numerous scandals this is a presidency teetering on the edge. On the Trump Russia evidence, the signs of Trump engaging in obstruction have been abundantly apparent for quite some time, but now direct evidence of collusion is creeping into the equation. Not just the circumstances surrounding the Trump Tower meeting, but now we hear PR TV lawyer Rudy alluding to a campaign strategy meeting a few days prior to & specifically about the main meeting with the Russians, apparently a story Cohen &/or his lawyer are leaking: giulianis-strange-second-meeting-mention. That would indicate serious intent to get dirt on Hillary by the campaign staff involved. Whenever Rudy tries to get out ahead of a story, rest assured Trump is about to get hit with another negative headline. And just because they wanted to keep Trump above the fray during the campaign with him not attending these meetings in person, there is every reason to believe the now-president was aware & calling the shots. 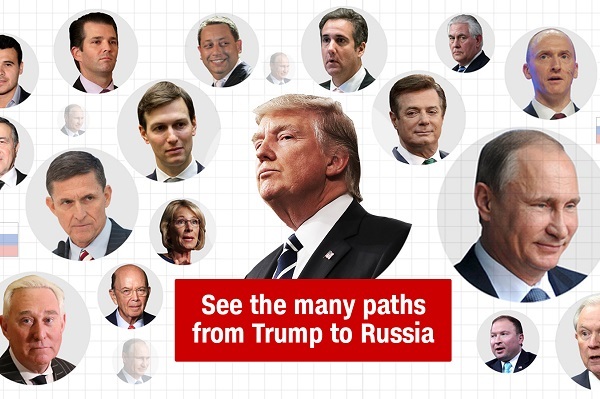 The dots still need connected by special counsel, but let’s brace ourselves for the strong possibility we’ll at some point learn Trump committed a criminally-impeachable offense. Perhaps we’re as close as a corroborating witness validating Cohen: legal-expert-cohen-flipping-puts-trump-one-witness-away-from-catastrophe. As for Rudy, his rambling alibis for his boss are more convoluted than ever, enough to where he earns recognition in our song at the bottom of part 3. There’s speculation the Mueller report on just the obstruction side (if it’s ready) could be turned over to Rosenstein, & subsequently to Congress & filter out to the public, sometime here in August. After Labor Day, it’s presumed Mueller would be reluctant to turn over such a hot political document that could have such a huge impact on the midterms. Yes, impeachment boils down to being a political issue, but the politics would be shaped by the strength of the evidence of criminality. Many in the GOP are fully immersed in the trumpian cult & are beyond hope, but I have confidence should Mueller produce solid evidence of serious crimes, enough within the GOP would conjure up their ethical inner voice of conscience & adhere to the rule of law to do the right thing. The collusion evidence & other potential crimes may not be fully uncovered & compiled till 2019. But at any point should a smoking gun be found, the presidency could unravel quickly. Despite all the diversions & smoke & mirrors put up by Trump supporters & the echo, the basic plot to this Russian scandal can be expressed in simple terms. Russia did interfere in our presidential election, & if Trump can be in any way connected to this attack on our democracy, he can no longer serve as our president. That says it all in a nutshell. We would think Trumpeters would at least be disappointed in their master lying to them all the time, but they either don’t care or actually believe the lies, with Fox & the echo always there to double down on the lies. Lately Trump has turned his attacks into lying directly about Mueller, since discrediting his investigation may be the only option the prez has left. Along with multiple scandals hanging over this White House, the weight of the Trump Russia evidence looks ready to cave in on the prez. So out of sheer desperation, I wonder if Trump were to tweet out Mueller is an ax murderer, some in his base would even believe that. As much as none of this trumpian/echo rhetoric seems to make sense, we keep searching why Trump has this undying support from his merry band of Trumpeters: ct-met-dahleen-glanton-trump-supporters. And when it comes to the Trump Russia evidence we’re seeing, or going to see, I just wish Trumpeters & that echo crowd would finally come to the realization no amount of tax cuts or conservative justices on the court can justify such crimes against our nation. Trump legal minds & echo-pundits are even floating out this idea colluding with the Russians was no big deal: giuliani-says-hes-not-sure-collusion-is-a-crime-despite-mueller-investigation. Yeah right, by that logic, if colluding with a foreign enemy to discredit our electoral process which could bring the charge of conspiracy is really not a crime, I suppose the ax murderer is innocent since the ax was at fault: no-collusion-oh-wait-maybe-collusion-but-collusions-not-a-crime. This argument collusion is not a crime is utterly nonsensical & nothing more than word-salad semantics, since collusion leads to a conspiracy charge, which really is a crime: rudy-giuliani-collusion-is-not-a-crime-trump-russia-investigation & also giuliani-knows-collusion-isnt-a-crimebut-conspiracy-is-and-trump-looks-guiltier-now. Rudy really is sounding more & more confused/unhinged: giuliani-trump-tower-cohen-mueller-russia. And with several of Trump’s echo-pundits echoing a similar theme of collusion being no big deal, along with aggressively ratcheting up the attacks on Mueller & Cohen, it’s a sign a big shoe may be ready to drop: if-trump-does-it-its-not-a-crime-or-so-republicans-think. We are now at one of those points. With the revelation on CNN Thursday night that, according to the network’s sources, Michael Cohen is ready to testify that the president* knew in advance of the now-legendary meeting in June of 2016 at which individuals connected to the Russian government offered to ratfck Hillary Rodham Clinton’s campaign for him, we stand as a self-governing republic at a stark, unclouded moment—either you believe the president* of the United States is utterly illegitimate, having conspired with a hostile power to gain the office he now holds, and that every act he has taken in that office, up to an including swearing the oath of office, is equally illegitimate, or you do not. It is now a binary. If Cohen is willing to testify to that effect, then the president* conspired with the regime of Vladimir Putin in order to gain control over the executive branch of government in this country—which includes not only the military, but the law-enforcement and intelligence apparatus as well. We are now at yes-or-no. Return with us, for a moment, to July 24, 1974. The Supreme Court has just ruled, by an 8-0 majority, that the White House had to surrender certain tape recordings to the Watergate special prosecution force. One of these tapes contained a conversation between President Richard Nixon and his chief of staff, H.R. Haldeman, from June 23, 1972, six days after four burglars in the employ of Nixon’s re-election campaign had been arrested in the offices of the Democratic National Committee in the Watergate office complex. It was the first time the president and his top advisor had met since the botched burglary. It had been Nixon’s position all along that he had not learned the facts about Watergate until a meeting with White House counsel John Dean in March of 1973. As recently as May of 1974, the president had said that the meeting with Haldeman had not had any political purpose but, rather, that they had discussed how to keep the FBI investigation of Watergate from revealing any ongoing covert CIA operations. A matter of national security, the president had said. A White House lawyer named J. Fred Buzhardt cued up the tape of June 23, 1972. This is part of what Buzhardt heard. That was their yes-or-no moment. Two years of ducking and weaving. Two years of legal rope-a-dope. Two years of increasingly implausible alibis as half the White House staff either were convicted or pled themselves into jail. It all came to this. It wasn’t easy. (Woodward and Bernstein point out that Buzhardt at first had the devil’s own time getting anyone to agree with him about the June 23tape.) But, by August, there was a new president of the United States because, ultimately, people stood at the yes-or-no moment and did what was best for the country. That’s where we are today, if CNN’s reporting is accurate and if Cohen is telling the truth. This isn’t the smoking gun. It’s just the latest smoking gun. There are smoking guns and there are smoking guns, and then there’s this administration*, which looks like the Union line on Cemetery Ridge just as what was left of Pickett’s division arrived. I have no faith at all that enough people will do what needs to be done about this compromised and dangerous man. My first reaction to this news was that it would get folded into some nonsense that pops on the Friday news cycle—a barely coherent rage-tweet, or something stupid from the House of Representatives. But this is the yes-or-no moment. If CNN is right, and if Cohen is telling the truth, then, in the immortal words of J. Fred Buzhardt, that’s the ballgame. Or ought to be. Regardless of one’s political party, it is hard to imagine that the Trump administration will survive its self-inflicted crush of lies, ethical lapses and incompetence much longer. Chaos is no way to run a popsicle stand, let alone the United States government. Because this presidency may well implode, we need to start thinking about how to minimize the inevitable trauma on Trump supporters and America as a whole. The reality is that, as a legal matter, both indictment and impeachment are fully on the table. No law precludes indictment of a president, and the Constitution does not address whether it’s permissible. DOJ’s Office of Legal Counsel — which advises the White House on constitutional questions — issued a couple of opinions during the Nixon and Clinton administrations which concluded no. Leon Jaworski and Ken Starr — investigating Nixon and Clinton, respectively — answered yes. Special Counsel Robert Mueller could seek a revised opinion from the OLC to clarify, for example, whether an indictment during Trump’s tenure would be constitutional in order to toll the statute of limitations, with a trial taking place after the president leaves office. What does this mean for Trump? Based on historical and legal precedent, he is well within the ballpark for either an indictment or impeachment. To be sure, many people have withheld judgment on whether he “colluded” with the Russians unless and until hard evidence is made public to prove it. That’s fine and makes sense, but it’s really beside the point. Any good manager knows when a particular hire is just not working. The federal government is a massive bureaucratic organization — a challenge for any leadership team. And by any measure, it’s in a severely compromised state under this president. People associated with the White House and the 2016 Trump campaign have been indicted or pleaded guilty to federal felonies. The intelligence community is singing a chorus of red-light warnings about the ongoing Russian attacks on our core democratic systems, while the president publicly blinks that reality. Meanwhile, Robert Mueller continues to churn out indictments that seek accountability for the unprecedented assault on our electoral process and our way of life. Yet, even for the most loyal of public servants like Mueller and Deputy Attorney General Rod Rosenstein, looming dismissals remain an ongoing political threat. Of course, we don’t get to know how things will actually go down. But it’s not looking good for this White House. Many of us have watched a neighborhood restaurant cling for dear life, despite its poor food and terrible service. One day, we drive by to find the front door boarded up. It’s a fact of life that organizations can’t continue to run the way the executive branch is being run right now and remain viable. Candidate Donald Trump vowed to expose dirt on his political opponents Bill and Hillary Clinton just two days before the controversial 2016 Trump Tower meeting that his former lawyer Michael Cohen insisted Trump knew about. Trump never delivered on his promise after his eldest son Donald Trump Jr., son-in-law Jared Kushner and then campaign manager Paul Manafort met with attorney Natalia Veselnitskaya in 2016. The men expected to be presented with damaging information about Democratic candidate Hillary Clinton, but the attorney failed to deliver, Donald Trump Jr. told Senate investigators. His father’s promised speech on the Clintons then sank without a trace. MSNBC’s Donny Deutsch said President Trump’s former attorney Michael Cohen told him several months ago that Trump knew “everything” going on during his 2016 campaign, including about his son’s meeting with Russians inside Trump Tower. A panel on Friday’s“Morning Joe” was discussing a new report that Cohen says Trump had prior knowledge of the June 2016 meeting with Donald Trump Jr., campaign officials and a Russian lawyer whom they’d been told could offer dirt on Democratic presidential nominee Hillary Clinton. “In my past conversation with Michael, what he’s made very clear to me is … nothing went on in this business without Don knowing about it, and he led me to believe that he could bring Trump back to Russia,” Deutsch said. “What came out yesterday to me was not a surprise, based on conversations Michael and I had had,” he added. “I don’t want to use his exact words, but that everything that was going on, Trump knew about.” “Did he reference this meeting in particular when you talked to him?” fellow “Morning Joe” contributor Willie Geist asked. “Yes, he did,” Deutsch replied, adding that someone else was in the room when they discussed the meeting. CNN reported Thursday that Cohen does not have evidence to back up his story, such as audio recordings he is known to produce, but that he is willing to discuss it with Robert Mueller in the special counsel’s investigation into Moscow’s election meddling and any possible coordination with the Trump campaign. Trump Jr., along with then-Trump campaign chairman Paul Manafort and White House adviser Jared Kushner, met on June 9, 2016, with Russian lawyer Natalia Veselnitskaya. Music producer Rob Goldstone arranged the meeting, and told Trump Jr. in an email that a “Russian government lawyer” was offering information that “would incriminate Hillary and her dealings with Russia and would be very useful to your father.” “If it what’s you say I love it especially later in the summer,” Trump Jr. replied. Interestingly, Trump’s TV lawyer Rudy Giuliani didn’t deny the allegations Thursday night; he simply attacked Cohen’s credibility. Giuliani’s defense that Cohen is a “pathological liar” raises the question as to why the president would employ such a scoundrel for years. Moreover, given that Trump has told thousands of lies as president and that the large majority of Americans think Trump is dishonest, he’s not in a particularly strong position to get into a credibility contest with Cohen. Step back for a moment. Cohen’s potential testimony is nothing short of amazing — the sort of one-in-a-million piece of evidence prosecutors dream about obtaining. Now of course it is true that many observers strongly suspected Trump must have known about the meeting that transpired. Donald Trump Jr., many onlookers surmised, would never have gone forward with the meeting without getting a thumbs up from his father. Constitutional scholar and Supreme Court litigator Laurence Tribe tweeted, “If Cohen credibly testifies Trump knew in advance of the 6/9/16 meeting that Donald Jr, Jared, etc, had with Viselnitskaya & other Russians in Trump Tower to get dirt against Clinton in June 2016, that’s direct evidence of Trump/Putin collusion. Huge.” Several points are worth underscoring. First, the latest Cohen news reminds us that we know a fraction of the potential facts in the Russia case. Roger Stone, Manafort and Cohen — if persuaded to cooperate — could have substantial, relevant information, including knowledge of the Russian hacking. Second, if Trump’s direct approval of cooperation with Russians can be proved, it will be the biggest political scandal in American history. His presidency for all intents and purposes would be delegitimized. We are talking about a presidential candidate who sought and received help from a hostile foreign power, covered it up and “repaid” the favor by public obsequiousness to that power’s leader. Again, this has yet to be proved. Third, Republicans who have enabled Trump by smearing law enforcement, creating bogus scandals, defending Trump’s attacks on the Justice Department and rationalizing support for his presidency (“But Gorsuch!”) risk public humiliation and ruin. Nothing Trump has done or could possibly do would make up for participation in a conspiracy and obstruction, not to mention betrayal of his country. (Members of Congress who may have actively conspired with the White House themselves could have legal exposure.) Fourth, the potential discrediting of a presidency and the delegitimization of an elected commander in chief is gravely serious and should be resolved before Trump picks a Supreme Court justice (who potentially could determine Trump’s fate). Finally, members of the administration should be very, very careful before throwing around Trump’s favorite phrases (“witch hunt!”) and trying to discredit the investigation. In fact, before this gets even messier, now might be a good time for staffers to exit and get far away from this unfolding legal disaster. As Martin points out, much of what President Trump’s House Republican allies have been doing cannot be called oversight; it is political skullduggery intended to protect the president and undermine the investigation into Russian interference with our democracy. There is nothing official in sneaking over to the White House to review classified materials and then publicly misrepresenting them. There is nothing official in outing a confidential source. Moreover, one doesn’t have to be a mystery writer to surmise that Nunes and members of the Freedom Caucus may have been working in concert and consultation with Trump lawyers and/or aides. In particular, the crafting of the Nunes memo and its release by the White House was a joint operation, if you will, requiring congressmen to piece together a misleading account and the White House to sign off on it, authorizing its release. Congressmen, Trump lawyers and White House aides conferring with intent to mislead investigators and the public, to disable the inquiry and/or to discredit law enforcement sounds an awful lot like obstruction of justice. Conversations or documents relating to that sort of conspiracy are in no way privileged. An investigation into Republican House members’ antics is critical if we want to hold them responsible for actions injurious to our criminal justice system. It is also necessary in order to uncover who if anyone they were colluding with on the White House side of the operation. Any White House official and/or lawyer — with or without the president’s knowledge — scheming to obstruct the investigation in concert with members of Congress needs to be investigated and held accountable. In sum, for now, the focus of the Russia investigation properly has been on the president’s action and those of others in the White House and Trump orbit. However, we shouldn’t forget about Republican representatives’ malfeasance and the goings-on between Trump loyalists in Congress and those in the White House. Rather than simply play defense on behalf of Rosenstein and the Russian investigators, defenders of the rule of law need to go on offense, demanding Nunes, Meadows and Jordan come clean on their actions in support of a president trying to thwart a legitimate investigation. It all needs to come out. On Friday, President Donald Trump finally chaired a meeting of his National Security Council devoted explicitly to combating electoral interference in the United States. The meeting, which was meant to cover all activities federal agencies were undertaking to protect elections, reportedly lasted less than an hour and ended with no new directives. In the nearly two years that have passed since the 2016 election, a few federal agencies have taken steps to combat electoral interference. The National Security Agency and U.S. Cyber Command are coordinating to combat cyber threats, and the FBI has created a “foreign influence task force.” The State Department, meanwhile, was given $120 million to combat election meddling — and has spent none of it. But current and former officials familiar with the Trump administration’s response to electoral meddling told NBC News that in the White House there remains no coherent strategy, no single agency or person in charge. This lack of action was emphasized in Friday’s meeting. Although one senior administration official told the Washington Post that it was productive, no new actions or coordinated strategies were discussed. Instead, over the course of barely an hour, those present mainly re-hashed activities that have already been undertaken. The pace of inactivity has angered Democrats. “President Trump’s inability to acknowledge that the Russians interfered in 2016 and that they will be back in 2018 is really hampering the government’s response to this threat,” Sen. Mark Warner (D-VA) said. “We just don’t have a whole-of-government strategy for dealing with this problem.” Senior officials have also privately admitted that U.S. actions haven’t given Russia second thoughts about interfering in elections again, a point that was highlighted at Trump’s July summit with Russian President Vladimir Putin in Helsinki. There, Trump said that he trusted Putin’s assessment of who meddled with the 2016 elections more than his own intelligence agencies. Three days beforehand, Special Counsel Robert Mueller had filed an indictment against 12 member of Russia’s military intelligence agency for hacking materials that were later used in the pro-Trump WikiLeaks propaganda campaign. “My people came to me, Dan Coats came to me and some others they said they think it’s Russia,” Trump said during the summit. “I have President Putin, he just said it’s not Russia. I will say this. I don’t see any reason why it would be, but I really do want to see the server.” The Daily Beast reported this week that Russian hackers used the same phishing strategy they employed against Hillary Clinton’s campaign chairman, John Podesta, to target vulnerable Missouri Sen. Claire McCaskill (D). The senator said in a statement that, while the attack was ultimately unsuccessful, it was “outrageous to think that they can get away with this.” Intelligence experts have also warnedthat Russian hackers are particularly keen this year to target the U.S. electrical grid.